Planning permission was granted for a 22-floor tower on the 30th November 2016. The decision is contrary to the Council’s own planning advice in ‘The future of Redcliffe’ and in its ‘Tall Buildings Policy Advice’. The development will yield £5m to the Council in Community Infrastructure Levy. Two councillors abstained from the vote, none voted against. A planning committee will decide the Redcliffe Quarter planning application on the 30th November. The Society continues to support a high-density development on this site but has campaigned against the inclusion of a tall building. At the beginning of November, the developers (Change Real Estate) filed the plans of an amended design. The principal amendment was to lower the height of the block that abutted the tower and to transfer the foregone accommodation to the tower. In consequence, the tower is thinner and taller. It has risen from 18 to 22 floors. The roof level blue-glass feature is removed. The Society has confirmed to the Council that it maintains its opposition to the scheme. 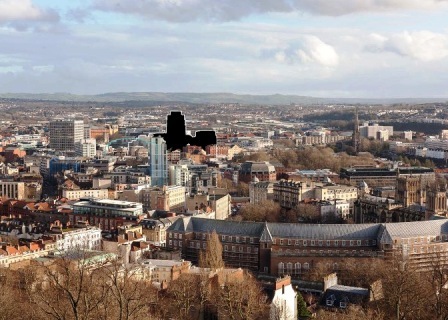 Bristol Civic Society supports the proposed new Redcliffe Quarter urban hub, but joins Heritage England and the local Design Forum in opposing an 18 floor tower that would dominate Bristol’s city centre skyline and harm the setting of St. Mary Redcliff. For the good of the future Redcliff Street scene the Society also questions the height of the general street profile of some of the perimeter buildings. The Civic Society Press Release has more details. The Society has commented on the planning application. Subject to the height objections, the Society strongly supports the application. The Society strongly supports the principle of urban intensification, and supports the mix of uses, the creation of the new cross street and the other contributions to improve the surrounding streets. 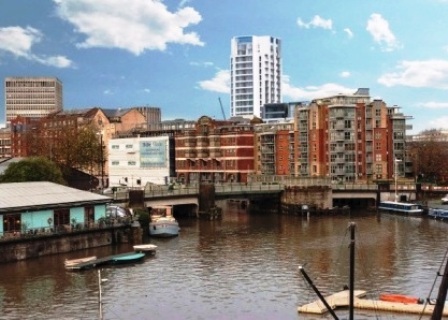 The Society considers the scheme as a whole will make a substantial and valuable contribution to the re-urbanisation of a neglected part of the city. The Society does not accept that the need for densification and the social and economic renewal of this character area of Redcliff automatically creates a case for a tall building in this location. If built, the tower and the buttressing blocks would dominate and harm the area’s character. The Society questions the height of the general street profile of some of the perimeter buildings. The Society objects to the proposed illuminated blue glass crown to the tower. 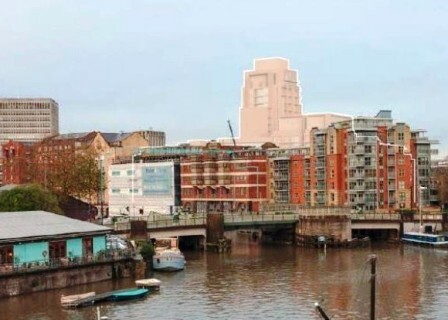 These montages, taken from documents filed with the planning application, show how the skyline will be dramatically affected by the development. The Society supports this development, which could transform this part of Redcliff socially and economically. The Council has a long standing aspiration for comprehensive redevelopment of this major site, which is early in the planning process. Change Real Estate (Change) proposes to redevelop a block of land between frontages to Redcliffe Street and Thomas Street and which runs from the back of the properties that face Thomas Lane south to a frontage on Three Queens’ Lane. The Kwik Fit garage is not included in the scheme. The Chinese supermarket/restaurant will remain. Change already has planning permission to develop the northern part of the site (Sampson Court), which will create about 130 flats. The combined scheme would build up to 480 new homes, retail and office space, a hotel, parking, public realm and landscaping. An earlier planning permission consented to the demolition of the long vacant warehouses. At the centre of the site will be a distinctive food and drink area accessible along a new pedestrian route between Redcliff Street and St. Thomas Street. The Council encourages high quality design, which means dual aspect flats that receive a high level of natural light. The position of the hotel is not decided yet. Street narrowing is not achievable given existing services. To unify this characterless area and to mitigate the scale of the new buildings Change will landscape the surrounding streets by carriageway narrowing, tree planting and upgrading the pavements. The proposal is to accommodate 350 flats in three blocks that range in height from 4 to 12 storeys. The design of the elevations remains at the stage of massing. Change has no yet agreed the scale, height and articulation of the new blocks with the Council. 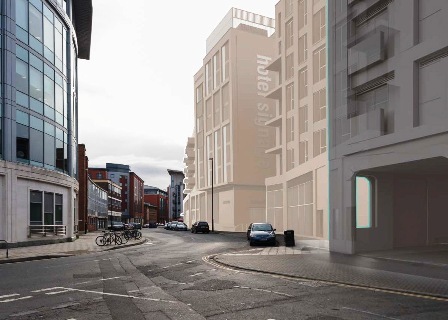 The Council’s current view is that part of the building that fronts Redcliff Street should be a storey lower. It is taller than the heights of the surrounding buildings justify. 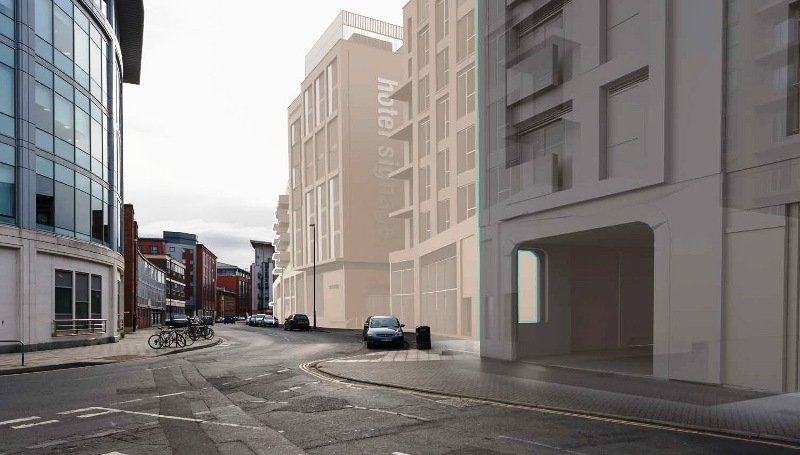 The Council has similar concerns about the height of the building on the corner of Three Queens Lane and St. Thomas Street, which would stands out as a much taller building than its neighbours. The 13 storey building at the centre of the site appears to be a significant issue. 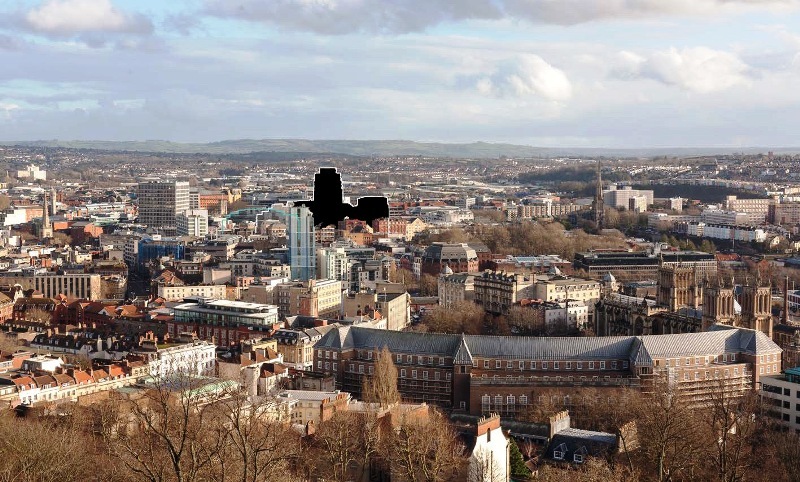 The Council’s concern is that Change’s wish to develop a signature building to define the site could have a potential adverse impact on existing historic buildings and their skylines. Bristol Civic Society’s original response [PDF, 448KB] Right-click to download, click to view. To locate this site, use this link to the Google map of the area.